The athlete-activist icon has nothing but support. 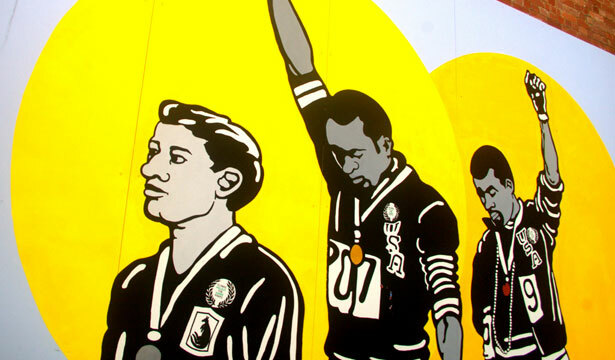 Yesterday, I spoke with Dr. John Carlos, one of the “fists of freedoms” at the 1968 Olympics in Mexico City. (Full disclosure, I had the privilege of co-writing his memoir, The John Carlos Story: The Sports Moment That Changed the World, 2011.) Dr. Carlos is as “old school” as they come: someone who believes strongly that athletes have obligations to give their time, money and physical presence to “impoverished communities, black, brown or white” and work to make the world a better place. He believes in honesty, fairness and the value of courage as a staple of whether or not a person actually has character. He taught me that over the course of your life, it’s far more important “to be a human being than to be a brand.” With that in mind, I was very curious what Dr. Carlos would say about the story scorching the sports world: the “coming out” of Jason Collins. I simply asked old-school John Carlos what his thoughts were about Collins’s announcement that he would be the first active male athlete in North American sports to come out of the closet. Dr. Carlos’s “old school” answer was beautifully “new school,” with an old-school warning to the National Football League. Here are his words. They made me smile, and I hope they do the same for you. I think we all look forward to the day when a player—male or female—coming out isn’t news at all. But now it is. Jason Collins matters. And given that Collins has gone out of his way to say that he owes a debt to those in both the African-American and LGBT movement who “paved the road for me,” the support from the generation of 1960s activist athletes matters as well. Walmart workers are heading to Bentonville headquarters, Freedom Ride–style, to speak up to shareholders. Read Josh Eidelson’s report.